Remember the days when the annual Realscreen Summit was an intimate little event with 500 or so of your best friends? Well, those days are long gone. 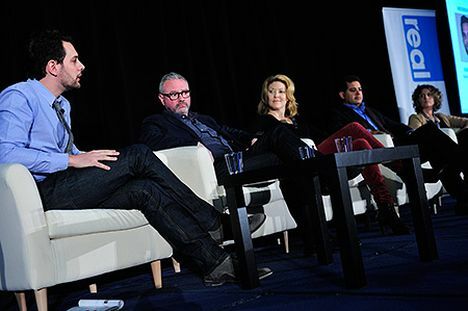 The latest Realscreen, held at the end of January in Washington, DC, attracted more than 2,550 participants. This edition, the 16th, took over the entire Washington Hilton, and was sold out—even during a "polar vortex." What does this mean for documentary filmmakers? Surprisingly, there was some good news, and good discussions about documentary filmmaking. New outlets, such as Esquire, Pivot and Al Jazeera America, were there along with the usual suspects—PBS, National Geographic, Discovery, and a host of other domestic and international players. Sure, there were plenty of master classes and panels about reality TV, pitching ideas, and changing formats and audiences. But according to Claire Macdonald, Realscreen's vice president and publisher, "We always look for a balance between docs and reality." This year the conference moved from downtown DC to the Hilton to get " better flow" and provide more space, according to Macdonald. Most participants thought the bigger space worked, and there was always an open chair in a very crowded room. "The organizers worked hard to facilitate meetings," notes three-time attendee Jim Lewis. "It is the most open-door conference in the industry." The conference started off with a keynote speech by CNN Worldwide President Jeff Zucker, who spoke about his channel's renewed interest in docs. "We can't rely on just breaking news," he explained. "We need to broaden our offering in the nonfiction world." Although the network will still be known for its news coverage, there are more docs are on the horizon. "We can walk and chew gum at the same time," he quipped. With CNN presenting ongoing shows from Morgan Spurlock and Anthony Bourdain, along with eight new series from Tom Hanks and Ridley Scott's respective companies, Zucker defended the channel's emergence as a doc player, calling the shows "smart, engaging knowledge. It's entertaining." CNN is actively looking for more shows, Zucker said. "We are open to pitches, commissioning and working with outside production companies. It's all about characters and good stories." Following the success of Blackfish in 2013, ten new films will be premiering this year, too. The CNN in-house unit is also increasing production to 35 hours in 2014. Echoing Zucker's words were CNN Worldwide Senior Vice President of Development and Acquisitions Vinnie Malhotra, who spoke on the panel "Risk-takers and Trouble-makers." "If you had a feature-length documentary you wanted to get on TV, your options were PBS or HBO," Malhotra said. "But now, there's CNN." He explained that CNN is in this side of the business long term, and is looking for films that can drive the conversation on a national level. Another executive on that panel was HBO Vice President Sara Bernstein, who emphasized that every documentary has risk, and that every doc filmmaker is a risk-taker in some way or another. "It's not just about putting your life on the line," she maintained. HBO programmers rarely know how a film will end, which for the network is a big risk in and of itself. Ironically, several filmmakers invited to the event—and who are known to take risks—were not there. Jehane Noujaim (The Square) was en route to Egypt to check on a bombing outside her office, and Laura Poitras, (The Oath) feared being arrested upon re-entering the US after her role in helping Edward Snowden release classified NSA documents. 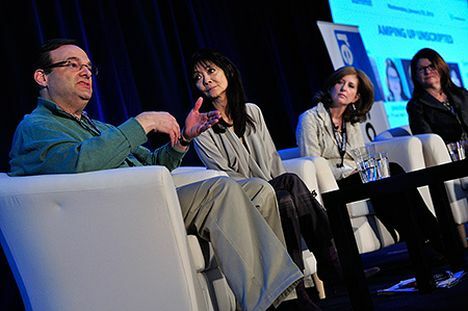 Al Jazeera America made its debut at Realscreen through the panel "Amping Up Unscripted." The New York-based channel is receptive to pitches, as Kathy Davidov, senior executive of documentaries, explained. "We're an American network programming for an American audience. We are really open to stories that start a conversation." They can be more traditional, observational or even lighter in content. The channel is working with such established filmmakers as Albert Maysles, Barbara Kopple and Alex Gibney, and its programming is a mix of full commissions, acquisitions and co-productions. Al Jazeera America is also interested in specials and series. Its first series, Borderland, follows six Americans who trace the life story of a dead body found along the US/Mexico border. Jana Bennett, the new president of FYI and LMN channels, is looking for more unscripted programs to program alongside the movies on LMN. She voiced a specific interest in crime and detective shows. FYI, formerly BIO, is re-branding as a lifestyle channel for a young upscale audience. Bennett is looking to commission 300 hours of programming during her first year for FYI. Shannon Malone, vice president of Red Rock Films, maintains that Realscreen offered a positive outlook for documentary filmmakers. "I think the rumors of the death of documentary television are greatly exaggerated," she says. "The marketplace is evolving, and while past outlets have grown in stature, other channels have broadened their programming and have offered more opportunities. CNN, Al Jazeera America, Pivot, Netflix and others are great additions." Flora Nicholas of Brainwave Productions agreed: "More broadcasters/channels seem open to docs in general." Other panels provided information in an entertaining way. "America 101" was billed as a primer on what international executives should expect once they hit the US shores. Moderator David Lyle, CEO of National Geographic Channels, brought his traditional bottle of Scotch to the event, so conversation was flowing. Among the topics: how US producers are "promiscuous" in pitching the same idea to many channels at once, and how fast and efficient US channels are when it comes to meetings. The "Producing Off the Grid" panel was an interesting exploration of risk analysis when you are producing a film or series that is based in the wilderness or on some outlandish competition. "Where Have All the Indies Gone" explored the advantages and disadvantages of selling off to a big conglomerate. Attendee Shannon Malone adds, " I'm a ratings/data junkie. I was fascinated by the 'Millennial Mind' chat. It could have lasted longer." According to attendee Jim Lewis, "The doc side was well served this year." In addition, the network personnel he met at the 30-minute sessions were "very open. The spirit of Realscreen is to connect a face with an email. And it works." Some panels were a bit of a bust if you were looking for substantial information. "Best of Times, Worst of Times" turned into a complaint session about the behavior of networks. "Climate Change? The State of the Natural History Nation" told attendees that networks are still looking for natural history—especially if it's done in some new way. And there was little talk of how to fund documentaries. But if you were looking for a quick dip into the pool of documentary filmmaking, there are few other places to be than Realscreen—even in the dead of winter. Lauren Cardillo is an award-winning Washington, DC-based filmmaker. Thanks to Lynn Hughes for her assistance on reporting on the Realscreen Summit.